Purified sweet potato starch-Purified sweet potato starch-Starch and Starch products-Products and services-Shandong SunKeen Biological Engineering Co., Ltd.
Bio Sunkeen selects famous spring sweet potato growing in hilly lands in Southwest Shandong in China to produce purified starch in a fully-enclosed, whole-pipeline and full-automatic way by adopting advanced 19-level cyclone production and processing equipment. The production of purified starch only takes 15 minutes after sweet potato enters into production line. 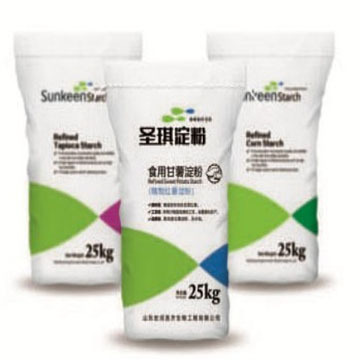 Bio Sunkeen starch is characterized by stable and top-notch product quality and fine texture. All Bio Sunkeen sweet potato noodles are made from high-quality sweet potato starch by more than 10 processes including mixing, freezing, pre-drying and shredding. As a genuine natural food, Bio Sunkeen sweet potato noodle tastes smooth and elastic and does not break without milky soap after being cooked for a long time.